The 5th September issue of Weekly Famitsu magazine (which comes out tomorrow) has fallen into the hands of some lucky fans in Japan and it seems there are more new characters announced for Sengoku Basara 4. Strangely there are four characters even though we know we should have five new ones by Tuesday. It makes sense that they're bolstering the Oda army now to prevent the game's theme of 'Sengoku Creation' turning into a one-sided 'Toyotomi Creation', but are they still saving Yukimura for next week's Sengoku Basara Magazine...? This time we have three returning veterans and one new face. Since one of the returning characters has been made unplayable, can we expect some changes to his move set? It's odd because he was only just made playable again in Sengoku Basara 3 Utage (as his alter ego Tenkai). It might make sense if there are plans for him to be a paid downloadable character later on; it could be argued that fans can already use him in the previous game which lets the team focus on other characters. In that case, none of the Sengoku Basara 3 Utage veterans are safe from the axe. I'd much prefer DLC to a completely unplayable character. Anyway, here are the character details from Famitsu. Twitter user mariko_zero has some pictures: Matabee/Kojuurou, Nobunaga/Mitsuhide, gameplay, introduction, Matabee close-up. Hyakki26 added a better picture of Kojuurou. Weapon: Kiba ('strange blade', but pronounced like 'fang'). It's a curved, uneven blade. Description: Originally a warrior in the Kuroda forces, now he drifts around the country of Hinomoto (Japan) with no master. Matabee is very proud and holds a strong grudge against anyone who wounds his pride, vindictively stalking them and writing their name in his 'Matabee Enmachou'. 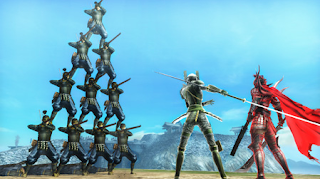 The screenshots show Matabee launching enemies into the air with a variety of slashing moves, with the caption declaring that whether it's cutting or throwing, he's suited to any kind of battlefield. He can throw his kiba like a boomerang, controlling its trajectory to sweep up enemies in its path. He's also shown creepily leaping towards Masamune's back, with the caption stating that Date Masamune's name is written right at the top of Matabee's mark book. What kind of grudge could he possibly have against Masamune? Notes: An 'Enmachou' is a normal teacher's mark book, however the kanji in the word happen to include the name of Enma, the Buddhist god of hell. They are likely playing on this idea to create a sinister character (with a vague Death Note theme?). I'm being strict about romanising and going with 'Matabee' to match 'Hanbee' and 'Kanbee'. It's fine to use alternatives like 'Matabei' or 'Matabe' if you prefer them. "A puppet...? A match for Matabee-sama...? There's no way, right? I said right... RIGHT?" Description: Masamune's trusted retainer, who also goes by the name "Right Eye of the Dragon". Kojuurou's sword skill has reached the level of a master and he also possesses calm judgement as a tactician. His existence is indispensable to the Date forces. While supporting his lord Date Masamune in proclaiming himself the "Dragon King", he watches over him so he doesn't go off track. Another of Kojuurou's duties is repelling raids by Matabee, who is shadowing Masamune. For many of the commanders - not just Masamune - there'll be more drama than ever before in this game's depiction of the turbulent Sengoku period. His unique skills can all be modified by holding the button down. Kojuurou protects his lord Masamune with a single katana. As part of his role as the Right Eye of the Dragon, he uses a multitude of unique techniques in quick succession. What is he thinking when he holds the sword engraved with the name "Bonten"? Note: In the real world, Katakura Kojuurou was said to be responsible for killing Gotou Matabee in battle. This feat would actually have been performed by the son of the original Kojuurou - however, Capcom often blends Katakura Kagetsuna and Katakura Shigenaga together into one character, so it's likely to have relevance this time as well. "It's an order from the Dragon King...Masamune-sama. I'm going to make every single one of you yield." Description: The supreme commander of the Oda army, feared as the Demon King. He continues his merciless march as though to burn the whole country to ashes and reign over the land of Hinomoto with terror. Disinterested in the matter of Shibata Katsuie's past rebellion, he treats him as he would any other rank and file soldier. With the appearance of the final Muromachi shogun, Ashikaga Yoshiteru, seeing how Nobunaga takes aim at the country will be one of the highlights of the game's drama. 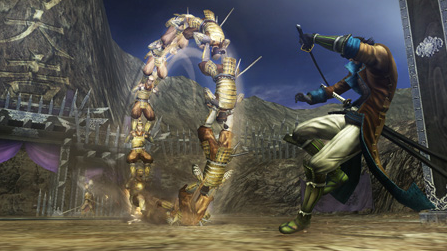 Long range shotgun attacks can be used in normal form, while powerful sword attacks can be performed by switching to 'Rokuma No Ou' form in battle. He demonstrates overwhelming power - as befits the Demon King of the Sixth Heaven. What will happen when the 'Demon King' Nobunaga and the 'Emperor' Yoshiteru come together!? "I'm the one who conquers everything. The human world... the world of desires...from the sea of heaven to far beyond...!" "It's rather noisy... perhaps you won't understand until you're turned into a corpse?" The 'nameless' enemy soldiers are finally getting serious after being nothing more than cannon fodder in the series so far. They'll have 'tacticians' amongst them who can coordinate the others by giving orders. Thus, enemies which were moving separately will join up in a military formation, becoming a powerful adversary and blocking the way. The magazine calls this ability a 'combined military formation' ('jinkei gattai'). The pictures show examples of the formations in action so I translated the captions too - the names are adapted from real-life military techniques, of course. Juugyorin ('Gun Fish Scales'). A rain of bullets will pour down! This is a formation for enemy soldiers with guns where they all stack up like a pyramid. It's easy to defend against a single rifle bullet, but if they're all fired together it becomes a threat. What happens if the tactician is defeated before the formation is complete!? Ootatetate ('Huge Shield'). An impregnable formation with 12 neatly-arranged shields! Soldiers with spears and shields gather together and form a single huge wall. Ootatetate allows them to attack people nearby with their spears while protected by the wall. It's said to be a very practical formation. To destroy it, going around the back would seem to be the only option, but it won't be that easy. Perhaps it's possible to jump over the top!? There may be an opportunity to break through before the formation is complete - after that the reach of the long spears will become a threat. Stray too close and a strike from the spears is waiting! Using teamwork with your comrade might be the key to capturing this mighty fortress. Ookurumagakari ('Great Winding Wheel'). The soldiers combine vertically! A splendid spinning attack! It starts off looking like a piggyback-ride, then with a rapid roll it becomes a large wheel - a surprising formation! The challenge is how to avoid this speeding rush attack. The troops ride on one another's shoulders in threes and fours, then combine! Don't underestimate the teamwork of ordinary soldiers. The enormous wheel comes towards you at a blistering speed! Kakuyoku No Jin ('Crane Wing Formation'). A gigantic tornado approaches!! If the Ookurumagakari involves vertical rotation, this one is horizontal rotation. A giant tornado is created from the vigorous spinning of the soldiers who connect their spears together! What can be done about it if you'll be swept up by getting too close? Is there some way of stopping the rotation..? Three soldiers spin around using spears as a pivot! As their turning speed increases, a tornado is formed! The game has moved up to twelfth position in Famitsu's Most Wanted charts. It's climbing steadily each time. I noticed that they used the wrong kanji for Masamune's name at one point in the article. Our next news should either be on Tuesday next week when the magazine launches (unless details leak earlier) or with an update to the official website in the next few days. Update 21/08/2013 (evening): Added descriptions for everything. Just need some pictures when the official website adds them and then this post is complete! Update 22/08/2013: The official website has updated so I added pictures of the characters. This post is now complete. The official website will update again on the 29th August to add character pages for the four newcomers. Update 22/08/2013: Famitsu has posted details from the magazine article on their website, so the descriptions in this post hopefully now make more sense with pictures available too. Re: Yukimura, after the Akai Hane news I'm just about to give up. :/ He's removed from his position and pretty much replaced with other characters apparently in all respects, he's ignored in promotion and promo materials (even Mitsunari called Ieyasu's name in the PV...), he's ignored in merchandise, and he's even snubbed in collaborations like the one with Akai Hane. I wouldn't be surprised if he wasn't featured in the calendar, but even if he is, even if he's announced for SB4 this week or in the magazine, for someone like Yukimura to be announced at this point, while being completely ignored otherwise, is just... :/ If anything this makes it clear that he's truly out of the picture as far as SB4 (or even the entire game franchise) is concerned, and even if he's in the game I shouldn't expect anything special. As for the announced characters, I'm glad for Nobunaga and Kojuurou (not that I doubted he'd be playable), though I'm disappointed that Ichi is absent and that Mitsuhide is NPC. But then, Matabee's character and design seems to overlap with Mitsuhide's. Honestly, I'm not impressed with the new characters so far. Katsuie is interesting (if way too gloomy), and Shika & Oyassan are adorable, but the rest is kind of meh, and the character designs in general lack the touch of craziness that made the previous character designs fun. Please don't apologise for saying what you really think! Assuming Yukimura appears next week, I'm mostly disappointed that the '13 characters' hint means he will be alone, without Oyakata-sama. My biggest hope for Yukimura's role in 4 has been that Shingen makes a proper comeback too and the two of them go back to their SB/SB2 dynamic, and announcing them together would have been perfect for that. Even if they're announced separately, it would have had much more impact if they suddenly appeared together like the Toyotomi pair. The Mitsuhide thing feels so weird. I'm not a huge fan of Mitsuhide at all since he's so deliberately slimy but I don't understand why they'd remove him as a playable character when he's quite popular. My partner suggested that Tenkai might still appear (especially as he's reasonably core to Kingo's storyline, assuming Kingo appears too). I think that would be too good to be true. Matabee interests me for his potential to stir people up in a self-centred, malicious way and for giving Kanbee some additional relevance which he sorely needs. I'm hoping Matabee's clothing looks better in a less washed-out picture. As for Mitsuhide, perhaps it's because with Katsuie and Nobunaga the Oda army already has two playable representatives? Or it could be just because in SB4 Matabee is the resident creep. Whatever the reason, it's a pity... Mitsunari is far from being my favorite, but it's always a treat to hear Hayami Shou play him. I do hope he and Matabee will get to interact, a creep-off between the two of them would be pretty amusing, especially since both of them have excellent seiyuu. About Matabee, to me he's like Mitsunari's shabbier and slouchier older brother who spent way too much time around Ootani Yoshitsugu. ^^;; (I mean, I know there's a limited number of colors available, and a limited way to make outfits look even vaguely historical, but I'd expect more creativity. Most of the old cast members have their distinct looks, and you can identify them with just a glance. This is missing from the new characters, and even worse, they keep reminding me of already existing characters.) But Miki Shinichirou is great, and having just rewatched the Pervert arc from Yondemasu yo, Azazel-san Z, I can almost hear him saying the supplied lines for Matabee. Also, a correction: it should be "Yukimura with any other character"
I'd hope Mitsuhide was demoted to NPC to give him some improvements if not for him being one of the most powerful characters in the roster in Utage...it's all very strange. The two creepiest guys facing off would definitely be an interesting sight. As a fan of the character and his gameplay style I'm of course very disappointed to hear that Mitsuhide isn't playable. However my next thought wasn't DLC but that they're saving people for an expansion. Which was also my first thought about the other important looking NPC (forgot his name.) An expansion/ sequel to this game is almost guaranteed since we got Heroes and Utage right? I would have liked to see Noh or another lady in this update too. Hopefully in the next one since it has only been new or returning guys so far. Matabee looks like combo of a lizardman and an ape with that stance. Look at those ape arms! Relative of Hideyoshi? Just kidding. Anyway...I agree! We need some ladies soon to even up the balance. Since the returning characters seem to be coming in pairs where possible, a Nouhime and Ranmaru, Kenshin and Kasuga or Oichi and Nagamasa combo would be ideal. Or someone new. Nou and Ranmaru would be good since the last returning characters were already playable on PS3; more classic characters would keep things fresh (and fill out the Oda roster nicely). Anthropomorphic Sengoku Basara animal-themed merchandise would probably sell very well! I'm hoping for Ichi too. I think she has a good chance because KobaP seems to have a soft spot for her, but if she's NPC I'll be sad - she has one of my very favourite movesets. They can have her gloominess jolt Katsuie's emotions to give him some kind of redemption after his fall into depression (though that wouldn't bode well for Nagamasa). Yes there are a lot of animal themes going on with the characters, but with the new guy they really made it obvious! I'm glad you two want to see Oichi back too. I really like her, and want her to be in this for gameplay and story reasons. Katsuie seems SO down so yes what will happen with them together?! since im in love with the idea of animal themes in BASARA, I hope after SB4 we get a spin off with all characters getting anthropomorphic forms like devil triggers in DMC but that may never happen. and matabei's animal theme seems to be more of a black mantis rather than a cockroach or lizard/frog but I could be wrong a better look may help clear it up. so I guess the number of reveals can be anywhere from 3-5 characters and no more than 2 of the same origin, there has also been a pair in each batch and at least one new also some characters have a relationship with a character(s) in the next batch so im gonna take my guess at the next batch: kanbei, yoshitsugu,(or) oichi, nagamasa, 1 cut returning PC, and 1 new or returning NPC.